No video to accompany, just a great write-up by Chris Keen. 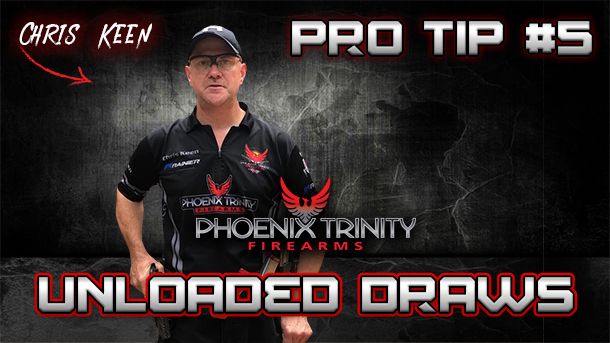 How often do you practice unloaded “draws”? Most major matches, & even some locals nowadays have at least 1 unloaded start stage. Being unprepared for that is no excuse. Especially when it’s something you can easily work on in dry-fire. Unloaded “table-starts” are one aspect of this, but unloaded “draws” are something completely different. When I prepare for a “table-start” I can focus my eyes & all my attention, on the gun/mag. But an unloaded “draw” gives you very little to focus your eyes on, until the gun is out of the holster. I like to look down & focus on a specific piece of my gun, like the muzzle/compensator for example, while waiting for the buzzer. That way my eyes are already focused in close when the gun & mag are removed from their respective holders. The next step that is crucial is getting that mag inserted into the grip as smoothly as possible. I found a little trick for this years ago… I put a white or red stripe (whatever color you like) on the bottom of the magwell so that if I see that color stripe when loading/reloading I know I’m good to go, and my eyes always snap right to it. Lastly you’ve got to rack that slide LIKE A BOSS! And if you shoot Open you know that some slide-rackers can be a little slippery. The racker on the PT HONCHO has a concave face that is made for being aggressive. Or if you’re shooting Iron Sights with the HONCHO, we have uniquely superior slide serrations that provide plenty of traction without being overly aggressive. Now you know what to practice during your next dry-fire or live-fire session.